When considering income by sector, the proportion of homes with incomes of less than $10,000 increased to 29 percent from 28 percent from one five-year period to the next, confirming there are more homes earning minimum wage in Puerto Rico. Puerto Rico’s median household income dopped by 4 percent from 2012 to 2016, when it stood at $19,606, in comparison to the $20,403 on record for the prior five-year period, according to the U.S. Census Bureau’s Puerto Rico Community Survey. The data released also shows that the towns with the greatest drops in household income were Guayama, Las Marías, Adjuntas, Lajas and Santa Isabel. On the other hand, the five towns with the highest income growth were Salinas, Naranjito, Culebra, Juana Díaz and Morovis. “At the Puerto Rico level, the data shows a drop of about $800 in household income during the most recent five-year period, when compared to the 2007-2011 period,” said Albnerto Velázquez-Estrada, statistical project manager for the Puerto Rico Institute of Statistics, the local government agency affiliated with the U.S. Census Bureau through the State Data Center Network. When considering income by sector, the proportion of homes with incomes of less than $10,000 increased to 29 percent from 28 percent from one five-year period to the next, confirming there are more homes earning minimum wage in Puerto Rico, he said. 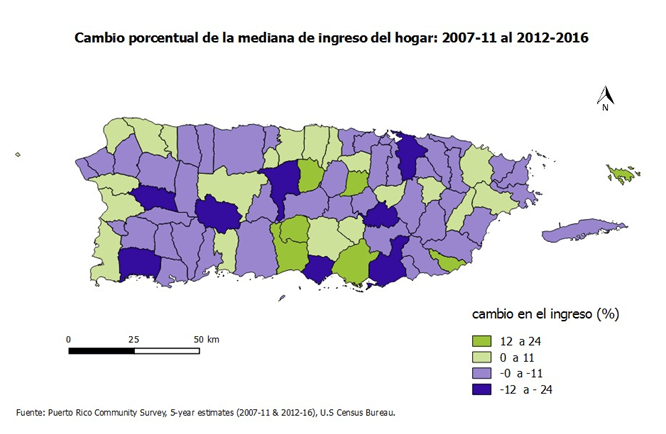 Hey Buddy!, I found this information for you: "Census Bureau: PR’s median household income drops 4% in last 5 years". Here is the website link: https://newsismybusiness.com/census-median-household/. Thank you.